It wears upon the soul to live in “transition,” to be in a time of waiting. I have been doing that for so much of my life. You spend your school years just wanting so badly to grow up and have the “privileges” of being an adult. Then there’s the “step” of college to get to your career and your “life.” For me that was an extended prolonged journey of graduate school followed by medical school and a longer than usual residency program. Finally, I thought. I have arrived. But at the same time, the kids started to arrive as well. And each one of them brought multiple “transitions” and waiting periods. Waiting for quarterly court hearings. Waiting for goal changes. Waiting for adoption. And just when it settles down, the boys are starting into preschool and kindergarten transitions. And a year and a half into what I thought would be their first stable school, we were asked to leave as the private school decided they didn’t have the “resources” needed to teach my eldest. So, we bounced into a townhouse to move into a school district that welcomed the boys. Half of my packed belongings went to my parents’ house and half went to my sister’s garage (that’s where the Christmas tree and decorations, the bikes, the winter gear, etc sits waiting). Waiting. For the past 3 years we have been living in transition, waiting to find a house to call our own. My boys have naturally made the best of their waiting. There’s a great community of friends here in the neighborhood. There’s a great diversity of cultures in this neighborhood. There’s good support. But they were so ready to move last year when we were a week away from closing on a house. It was a huge disappointment to lose the house, but that house also brought the stress of changing schools and new transitions. Now, however, they are giddy with anticipation as we are now less than five weeks from closing on a house!! And this time, I have settled into keeping the boys in the same school system and the same elementary and middle school. It’s been rough for me mentally as I keep trying to find the “best” school for them. I find pros and cons to all the choices. Finally, I’ve decided to put the priority on stability, acknowledge that I won’t find perfection, but that it is time to settle down for the sake of the boys and myself. And so, in this Advent season, as we expectantly “wait” to celebrate the birth of Christ, my family is also expectantly waiting and preparing for a new beginning. Christmas is always my favorite time of year. I think I just like lights…on trees, on bushes, on houses, on boys’ bunkbeds. They seem to emanate a feeling of peace and comfort. But the end of this year has been pretty bumpy and it’s been hard to capture any peace. It could be the endless roll of medical visits for my three boys (two fractures, bead in the ear, strep throat, medication checks, flu shots) or the endless saga of behavioral crises that my sister’s boys are wrestling with as the year comes to a close. It could be the pervasive sense of sadness that settled in in early November when less than half of the voters still triumphed. It’s impossible to see any Joy in the one who is to be our new leader, yet who is so far from a Christian role model that I want to shield my sons from all news until this crisis is over. It could be the deluge of photos showing the reality of hundreds of thousands of innocent people dying in Syria. It could be the feeling of powerlessness as a hurricane wipes out lives and livelihood for thousands in Haiti. It could be the unpredictability of violence in the neighborhood, the financial drain of a house still sitting on the market, the uncertainty of funding at my current employment. It could be a lot of little irritants throughout a day. It could be all-consuming disgust and annoyance. It could be boys who squabble, or whistle in the car, or throw remotes in frustration, or roll around on a kitchen floor to trip over when trying to make dinner. It could be the slow slow slow plodding march every….single….night to shift three little brains from alertness to dream state. It could be any of a hundred of weights in a single moment. But it could also be moments of Peace. (Nah, that’s only when they’re asleep). It could be moments of Love in the notes Mr. Ornery writes to say he’s sorry. It could be moments of Joy in watching Super Tall Guy in his first performance playing the saxophone. It could be moments of Hope in the excitement of The Little Guy waiting for Christmas (and expectantly looking for the elf that the babysitter likes to hide). It could be all these moments if the focus is in the right place. For there is only One from whom Peace passes all understanding, Love surpasses knowledge, Hope yields eternal life, and Joy fills the soul. Only one. May we all seek and find that Joy, Peace, Hope and Love this moment, this day, this year and into the next. Advent Week Two: Who is in control? “Do you or do you not have a bead in your ear?” I asked the 7-year-old for the hundredth (almost literally) time. I couldn’t decide which side of dragging children to the Express Care again I wanted to lean on. The otoscope at school apparently wasn’t working when the school nurse called me Thursday to explain the situation. My 25+-year-old otoscope also wouldn’t charge up so I couldn’t confirm Mr. Ornery’s story and given his orneriness, I couldn’t read his face. Was it worth going out another evening this week to check the ear? The problem was, the week was just not going the way I had hoped. My idea was that it would be my final week of “preparation” for my once-every-ten-years required pediatric recertification examination. Having taken the internal medicine exam in October, I had been studying almost every day of the week since summer when I sat with a thick book in my lap at the pool. Now I had just a few more days of cramming small details into my brain and I wasn’t feeling ready. Does he look like he ever slows down? But Monday was consumed with the fact that copper pipes were stolen from the basement of the house we’re trying to sell, necessitating quite of bit of work that my sister coordinated. Tuesday was the Little Guy’s orthopedic appointment (“When the cast comes off after 4 weeks, he’ll need to lay low for another 4 weeks” Um, have you met my Little Guy?!?). This was followed by a grand-slam knock-down homework battle prior to heading to a friend’s for dinner. Wednesday evening was karate. Thursday was going to be our evening at home so Mommy could settle and prepare for her test…..or head to Children’s Hospital Express Care. Friday morning, the day of the test, started with running late to the bus stop due to having to rescue the neighbor’s locked-outside dog, followed by cleaning dog do-do off Super Tall Guy’s shoes, and culminating in finding out there was a conflict with the babysitter’s schedule at the end of the day which needed some childcare juggling as I would still be in my test. Keep it coming. As hurdle after hurdle rolled my way, I realized that the preparation I was supposed to be doing the second week of Advent was laying all those burdens before the Lord. God was reminding me that there are many things in this world that I have no control over (and most clearly not the 3 little ones who live under the same roof with me!) and yet, He remains in control. As the things of this world – the big and the little – whirl around us and push and pull us, there is one thing that remains true forever. God is in control. 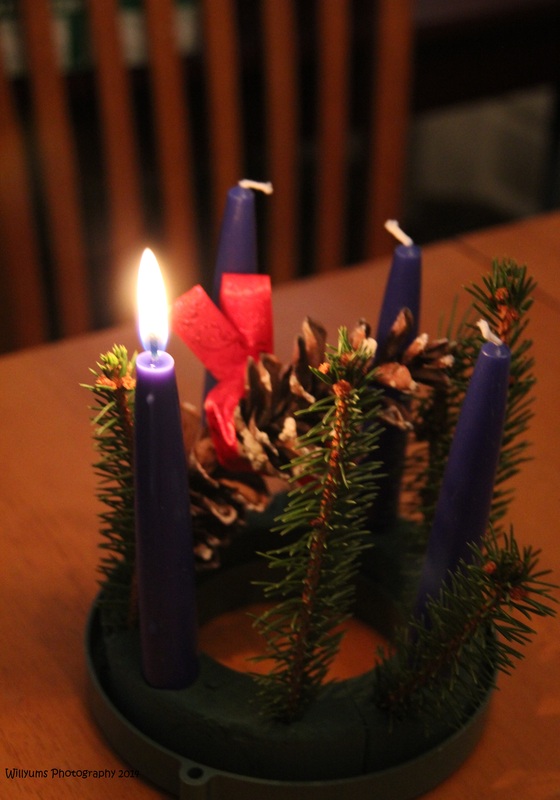 Advent Week Two – Preparation for what God has in store. Sunday was the first day of Advent. My boys don’t really care about the “anticipation” and the “waiting” for Jesus. They care about the wreath on the dining table that has candles on it. Candles can only mean one thing – the chance to fight about who gets to light the candles and who gets to blow them out. That’s what Advent is to them. Though they did learn last year that Mommy means what she says – keep fighting, keep arguing, keep driving me nuts, and that wreath disappears!! So we sit down to a fine dinner of spaghetti and meatballs Sunday evening and light the first candle – the candle of Hope. I ask each one what they are hopeful for – and no, that particular Christmas gift does not count. A couple hours later, during a typical wrestling match, Mr. Ornery apparently delivered a well-executed sweep kick that crashed the five-year-old to the floor. I did not witness said move as I was in the kitchen, doing what all single moms do after a meal – hiding and praying for a moment of quiet. But no, the Little Guy is screams in pain, and his unempathetic mom gives him a kiss and an elbow rub and a “get over it” look and we’re ready for bed, guys! After all, it is bedtime and sleep heals all wounds. And what I realize in that moment is that all I’m hoping for this Advent Season is a moment of peace….which is not to be. So here’s this year’s list of Advent Hope. 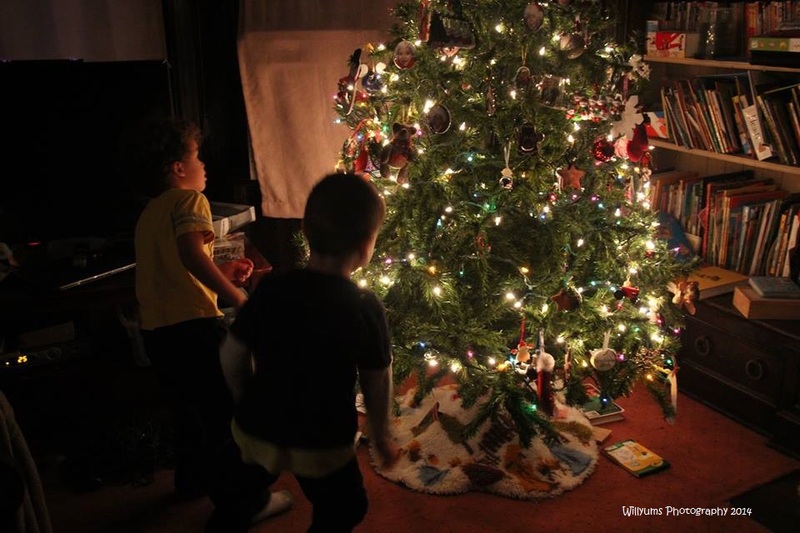 Hope for just a few evenings of quiet to sit on the couch and stare at the tree lights. Hope that the dog will never ever ever again bark from her crate in the morning and wake me up on my golden morning of sleeping in as she did last Sunday! Really, dog?!? Hope that we get a few more nice evenings to enjoy my early Christmas gift of a fire pit on the front patio (and again, not struggle with “behaviors” related to messing with fire!). Hope that there will be more dull moments this season – when the to-do list isn’t rumbling around in the back of my skull and the hype isn’t stirring up the boys’ inability to control impulses – and that we actually enjoy the days and each other (I know, too much to hope for, but I’m going to try). Hope that I can instill some meaningful traditions into this season where the boys catch a glimpse of the true meaning of Christmas and think about others for a few seconds; I’m only asking for a couple seconds. Hope for the world and all its people to find some peace and know that Christ is the Light of the world that disperses darkness. Hope for continued love and support of family and friends, and for patience….lots of patience….I need lots of patience….. He screams into the air. He sits on the edge of the bed. He is paralyzed. He can’t get off the bed. He can’t face the prospect of going downstairs by himself. I sit against the wall. Recording the conversation on the iPad on my lap. Encouraging him to venture downstairs. Refusing to get up for him. “Which feeling is more powerful?” I ask. There’s a sudden realization that the other brother must be downstairs then. He pops out of bed and runs down for a snack. Peace returns to the room. It is paralyzing. Fear is paralyzing. I know it. I have my own fears. Will I be a good enough Mommy? Will these boys grow up independent and courageous? Will I forever be alone? I have few paralyzing fears, though there are moments of them – when your car slips on ice, when there’s a new sound in the house at night and you remember you’re the only adult. Yet I sense that our world is troubled by fear of late. Fear of the unknown. Fear of the different. Fear of the random and sudden violence. Fear of the new. And maybe this is not a new experience – maybe it is just a resurgence or a cycle of difficult times. Whatever it is, I have noticed and felt it. Advent; the season of waiting. Advent, a waiting filled with a sense of peace. A confidence of knowing that there is hope. That there is a reason to celebrate. There is light within us. Light for the darkness without. “Darkness cannot drive out darkness, only light can do that; hate cannot drive out hate, only love can do that.” ~MLK Jr.
Let us have Love this Christmas season and hold up the light. The moments of parenting “expensive” boys! I sat beside him crying. “I can’t keep doing this,” I said over and over. I’m sure it was lost on him, but the feelings just become so huge and overwhelming to me. Okay….so it’s just a window – I say days later. Yes, it’s the stained glass window that he kicked out – recently replaced and huge – but it’s still just a window, and just the corner of the window. Yes, it’s another expense (you know, in addition to the TVs he has destroyed), but it’s still just a window. It will cost about $1000 to take it out and back to the store to replace the corner and bring it back, but it’s still just a window. And yes, it’s another marker of his inability to control his anger. But really, who am I to judge? Sometimes (a lot…) I don’t control my anger either and I’m 36 years older than him. Sometimes though it all just feels so “Big” – that suddenly everything is crumbling – that my son has enough “problems” to be asked to leave a school (okay, so a private school that worries they can’t meet his “needs”…); that I’m an awful parent who can’t figure out how to stop the “antecedents” and triggers of anger explosions in my kid in time to diffuse the situation; that we’re never going to get anywhere. You ever sink into this abyss? So deep that you drive sub-consciously to Grandma’s house with the youngest child while tears stream down the cheeks? And you remember sitting down on a date the other week and pausing at the question, “Do you ever regret it?” Tough question. Do I regret adopting three boys? My honest answer – “It’s pretty hard sometimes. But I don’t regret it. The boys need a mother to love them and I do think that the brothers need to be together.” And admittedly, I need them to bring depth and joy to my life. But driving away from my angry and now grounded son, my tears return to that question. Do I regret it? It certainly has been harder than I could ever have imagined. My mind briefly recalls reading about “reversed adoptions”…. “failed adoptions.” I remember being appalled (especially as it would completely undermine a kid’s sense of belonging and family and hope) and yet I think I can understand the draw to find an “easy” solution to the complicated mess called parenting. Sometimes it’s easy to pretend that this parenting is all fun and games. It’s the cheesy Facebook photos. It’s the awesome crafty Pinterest project. It’s the hugs and kisses and gentle sleeping snores of tuckered bodies. It’s the fluff and love. But it’s actually so much more than that.